The 33-9 Chicago Bulls have the best record in the Eastern Conference, and while Derrick Rose deservedly receives most of the credit for their success, Joakim Noah has played one of the best seasons of his career and he’s been a surprisingly effective offensive player, with a PER of 18.84. According to Synergy Sports, Noah is posting 0.908 points per possession (PPP) in half-court possessions, placing him in the 73rd percentile of all NBA players. Noah is best on offense when he plays off his talented teammates — moving without the ball, creating passing lanes, and finishing strong on dish-offs and putbacks. Noah posts 1.268 points per possession when he cuts to the rim, which puts him in the top third of NBA players. When Noah cuts, he reads the court well and typically makes good decisions about which open spaces to fill. On this possession, Noah receives a pass at the elbow with Rose in the corner. Noah dribbles to Rose, hands the ball off to his MVP point guard, and then sets him a screen. Rose comes off the screen like a bullet and looks to turn the corner and get to the rim. 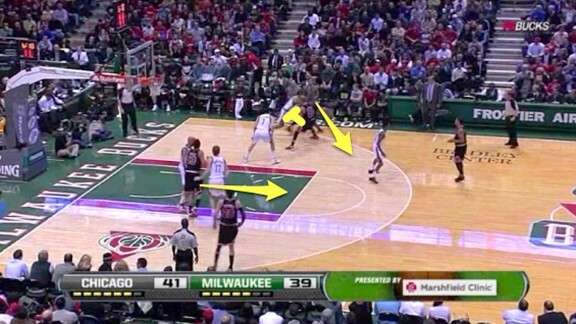 Because Rose is so deadly in the paint, the defense keys on him. 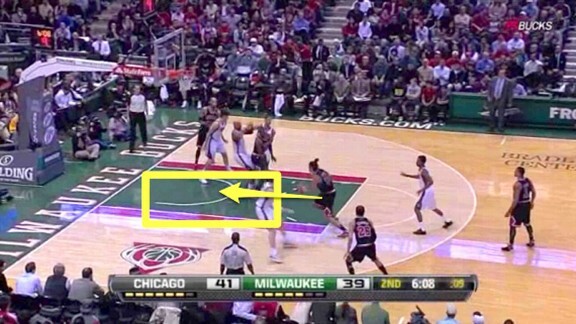 Noah’s man watches Rose on the drive and shades over to help against the penetration. With two defenders focused on Rose, Noah reads the situation and drives to the rim. Rose spots Noah and gets him the ball, and Noah finishes strong at the rim. Noah has also gotten better this season at playing in the space around the free throw line. In years past, when Noah caught the ball around the high post, he’d look to pass too often. Noah is a talented passer, but he had a tendency to over-pass in previous seasons. Now, he’s looking to attack more. 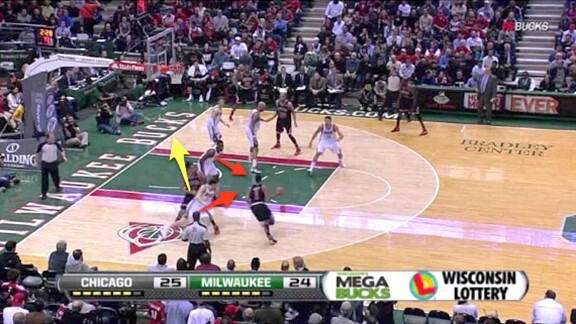 In this possession the Bulls execute a pick-and-roll on the wing with Noah on the opposite block. As Ronnie Brewer uses the screen and looks to get into the paint, Noah flashes into an opening at the elbow. When Noah catches the pass from Brewer, he doesn’t hold the ball and survey the court. Instead, he makes a strong, attacking move, going right into his dribble when he receives the ball. Because Noah is probably the Bulls’ fifth option on offense, opposing teams tend to lay off him on defense. When Noah gets the ball, he’s usually not being guarded closely, and this season he has learned to attack the space in front of him before the defense recovers. Noah attacks on this play, and it pays off. He gets to the paint and finishes strong at the basket. By driving to the basket, Noah — who shoots 25 percent from 10 to 15 feet and 57.8 percent at the rim, according to Hoopdata — gives himself a much better chance to score. Noah has wisely made a commitment to getting more shots close to the basket this season, rather than settling for jump shots. Here are the above possessions in real time. When you watch these plays live, the speed of Noah’s decision-making is impressive. He sees two defenders on Rose? Boom — he cuts to the front of the rim and looks for the ball. He sees space in front of him after catching a pass at the elbow? Bang — he drives and gets an easy layup. Perhaps the most impressive aspect of Noah’s movement off the ball is that he gets fouled 22.6 percent of the time when he cuts and receives a pass. This allows him to get to the free throw line and increase his efficiency. Noah draws so many fouls because he goes up quick and strong after catching the ball. Defenders rotate off Noah to contain the Bulls’ other threats (read: Derrick Rose), and this means that Noah often receives passes with his man out of position and hustling back to him. By going up quickly before his defenders can recover, Noah creates situations where the only way to stop him from scoring is to foul him. As well as Noah is playing on offense this season, he could still be better. He’s an elite offensive rebounder. According to Hoopdata, Noah grabs 14.4 percent of all the offensive rebounds available to him, ranking him eighth among all NBA players. Unfortunately, he’s not great at scoring off those offensive rebounds. According to Synergy Sports, Noah has scored just 89 points on 102 putback attempts. His 0.873 points per possession in these situations places him in the bottom 21 percent of all NBA players. Because Noah is so good at grabbing offensive rebounds, putback attempts make up almost a quarter of Noah’s offensive possessions — more than post-ups, cuts to the basket, or any other category. If offensive rebounding and putbacks are Noah’s bread and butter, he needs to do a much better job of scoring on the opportunities he creates for himself. Watch Noah work the offensive glass. The flaw in his technique is that he doesn’t try to control his offensive rebounds. Noah gets into great position when shots go up, and as a result he often gets a hand on the rebound, but one hand isn’t enough. He often tries to tip the ball in, instead of grabbing it with two hands and going back up strong. Sure, sometimes he can only reach a rebound with one hand, but there are several situations when he should be trying to secure the rebound, rather than attempting one-handed tips that just don’t work. 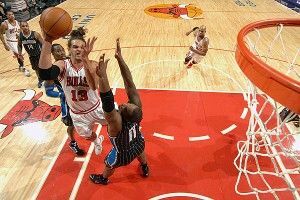 Noah has had much more success when he grabs offensive rebounds with two hands, gathers himself, and then goes back up. Securing the offensive rebound with two hands allows Noah to take advantage of his size and the position he worked to get in front of the rim. When he does that, he’s good at converting those close attempts. And to be clear, I don’t mean that Noah should catch the rebound, hold it, pump fake a few times, and then go up. He should still rise quickly for his putbacks. He just needs to make sure that he first gains control of the ball so he can attempt an accurate shot. If Noah can tighten up his game on the offensive boards and start converting more putback attempts, he would be close to playing the best offense of his career. He has already made great strides this season by reading defense and making quick decisions to move without the ball. He’s one more step away from giving the Bulls a significant offensive boost that they’ll surely need at some point in the playoffs.